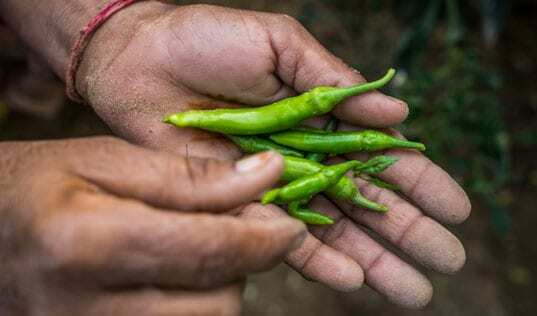 Farming families in a remote and arid region of India are benefiting from a project spearheaded by a leading energy company. Last month, husband and wife Indra Kodecha and Dhapu Devi (fourth and fifth from left) journeyed from their rural home in the desert district of Barmer, Rajasthan, to the bustling city of Gurgaon, near India’s capital New Delhi. 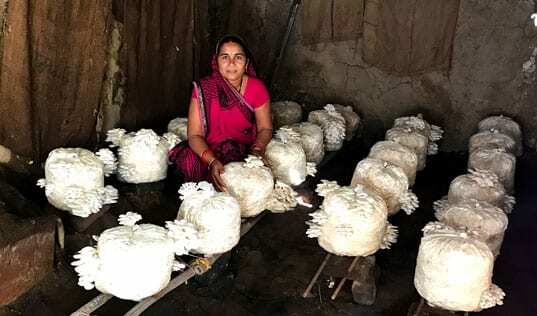 As participants in the Barmer Unnati project – a partnership between TechnoServe and energy company Cairn India Ltd. – they were invited to Cairn’s headquarters to exhibit cumin and red chillies that they produced with the project’s support. Over the course of the two-day promotional event in Gurgaon, more than 400 visitors stopped by the Barmer Unnati stall, including Cairn’s managing director and CEO, Mayank Ashar, who chatted with Indra and Dhapu. 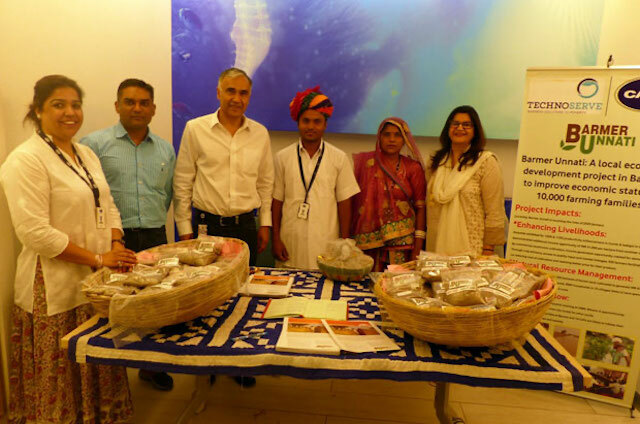 Other Cairn executives and representatives from partner organizations such as PricewaterhouseCoopers also engaged with the farming family, who sold packets of their products branded with the Barmer Unnati logo during the event. 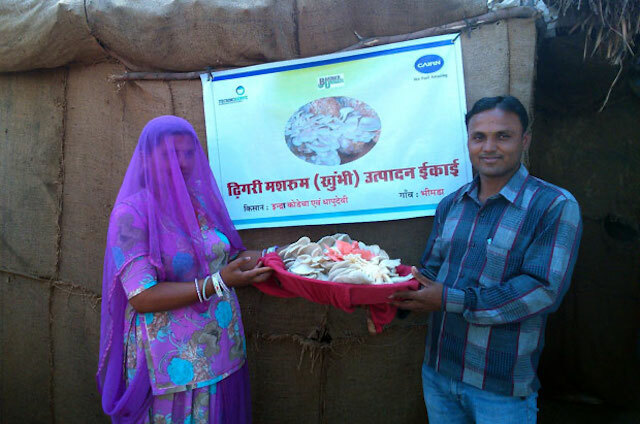 Indra and Dhapu joined the Barmer Unnati project in 2013. With training and advisory support from project advisors, the farming family started soil testing and preparing on-farm organic inputs to improve the quality of their corps. The expanded their crop portfolio to include vegetables and mushroom cultivation. Overall, these improvements have resulted in a 24 percent productivity increase on their 7-acre farm since joining the project. Barmer Unnati is designed to sustainably increase agricultural income for 10,000 farming households in Barmer. 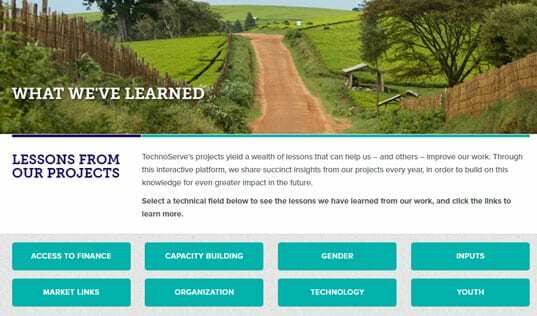 The five-year project is teaching farmers across the region about good agricultural practices, connecting them to high-quality inputs and introducing new agricultural technologies and strategies. Given the region’s arid conditions, the project emphasizes training on water management techniques. Learn more about Barmer Unnati.